It is possible that the man-apes variously known as Sasquatch, Yeti, Ukumari, etc. constitute the greatest and best known variety of mystery creature, and the only kind whose study has received a tacit nod from officialdom. Anthropologists have even gone as far as establishing its identity as the Gigantopithecus, an anthropoidal creature which may have survived into modern times by keeping clear of homo sapiens. The historic record contains mentions of these beings, such as that they were used by the ancient Medes and Persians as ferocious battle animals, and that Nearchos, Alexander the Great's admiral, encountered communities of these creatures on the barren shores of the Persian Gulf. The historian Arrian, whose Anabasis Alexandrii (Indica) was translated by E. Illiff Robson in 1933, mentions that as the Greek admiral headed westward, his galleys hugging the shore of the Asiatic landmass, he came upon a remarkable--and terrifying--group of natives. "Some were killed in flight; others were captured; but some escaped into the hills. Those captured were hairy, not only their heads but the rest of their bodies; their nails were rather like beasts' claws; they used their nails (according to report) as if they were iron tools; with these they tore asunder their fishes, and even the less solid kinds of wood; everything else they cleft with sharp stones; for iron they did not possess. For clothing they wore skins of animals, some even the thick skins of the larger fishes." The rough technology evinced by these hirsute primitives-- tropical versions of the Toonijuk or Tunnit who reputedly lived in Greenland and Bylot Island in ages past )--is also found in descriptions of the Maricoxis, bestial creatures confronted by the ill-fated explorer Col. H.P. Fawcett in the early 20th century while surveying the Matto Grosso. Fawcett's description of the Maricoxis, as "great apelike brutes who looked at if they had scarecely evolved beyond the level of beasts," would not have been out of place in Admiral Nearchos' log. The Maricoxis were considered primitive even by the standards of other primitive tribes, despite the fact that they wielded bows and arrows. Arrian mentions that the number of primitives who attacked the Macedonians stood at approximately six hundred. Did the ones that escape, assuming both males and females, retreat to the mountains of what is today northern Pakistan, moving on into what are now the modern republics of Central Asia (Kazhakistan, Turkmenistan, Tadzhikistan, etc.) to give rise to the legend of the Almasti? A fascinating possibility. One of these early chroniclers of Mexico's history--Fernando Alva Ixtlilxochitl--mentions in his book Obras Históricas the widespread belief that the Chichimecs, the earliest occupants of what is now Mexico, had to displace an old race of giants that lived there. This echoes not only the Biblical displacement of giants from Canaan by the advancing Hebrews, but other traditions surrounding the elimination of giants from Britain by a Trojan warrior named Brutus. The presence of these ancient colossi would thus account for the persistent discovery of abnormally large remains. Ixtlilxochitl also mentions the wars between the giants known as Quinametzin and normal-sixed humans. Memory of the Quinametzin was widespread throughout Mesoamerica, as can be seen from the information gleaned by Spanish explorers and colonizers. Bernal Diaz del Castillo, who accompanied Hernán Cortés on his conquest of the Aztec Empire, wrote of a belief among the Tlaxcalan people that "...their ancestors had shared the land with men and women of very tall bodies and large bones, and since they were very wicked and ill mannered, [the ancestors] slew them in combat, and what remained of them died out..."
Other information turned up by early missionaries is also quite intriguing. Fray Diego Durán claimed to have seen the bones "of immense giants" excavated "out of rough places". Fray Gerónimo de Mendieta was told by the older natives that their predecessors had been forced to struggle against giants, "and after this land was won, the bones of many tall men were found." Bernardo de Sahagún, the great Franciscan missionary, would be the first to suggest that the pyramids of Teothihuacan and Cholula were the handiwork of the vanished giant race. Wherever the conquistadors went, more stories were added to the body of information concerning these creatures. When the rapacious Nuno de Guzman reached what is today Jalisco, he demanded to know from the natives why a number of towns had been abandoned. They informed him that the towns had been inhabited by a band of giants who had come up from the south. There was to be no peaceful co-existence between the Quinametzin and the newly-arrived humans, who called them quinametzin hueytlacame ("huge deformed men" or "monstrous giants"). The advancing human tribes (tentatively identified as Olmecs and Toltecs) drove the giants out of their ancestral domain, causing some of them to flee to the north and others to the south, following the Pacific coastline down to Central America. Fray José Mariano Rothea, a Jesuit, sums up this belief as follows: "...in very ancient times there came men and women of extraordinary height, seemingly in flight from the North. Some of them went along the coast of the Southern Sea, while others took to the rough mountainsides..."
Fray Andrés de Olmos, writing in the 16th century, mentions a curious detail: the Mexican giants nourished themselves on oak acorns and a variety of weeds. This detail contained in the codexes enables us to contemplate a strange possibility: could the Quinametzin have survived into our present age under the guise of the tall, hirsute simian beings known as Bigfoot, Yeti, Sasquatch and myriad other denominations? Those interviewed by the Colonial-era chroniclers explained that tradition held that those giants who were not exterminated by normal-sized humans were chased into the wilderness, where remnants of their race still endure. Marc Dem, the French author of a number of works on the paranormal, has identified the Biblical Anakim with giant beings such as the Asian Yeti. Is there any evidence that such a race of giants actually existed south of the border? In 1975, Mexican ufologist Pedro Ferriz visited Calvillo, Aguascalientes (on the Pacific coast, famous for its intricate mazes of unexplored manmade caves) to inspect some ancient petroglyphs on the property of local landowner Víctor Martínez. Martínez told the ufologist that he was ambivalent about the petroglyphs, which he considered unlucky, particularly since "that affair with the giants". When asked to elaborate, Martínez explained that he had stumbled upon the ancient skeletons of two extraordinarily large creatures while tilling the soil. Martínez went into Calvillo to notify the authorities about his find, only to discover that the local police believed him to have killed both giants and wanted to incarcerate him! The farmer finessed his way out of the predicament, returned to his farm, and set fire to the bones. Argentina's Salta region has been the focus of a number of hairy hominid sightings for many years. This rugged, mountainous region could not differ more from the Sasquatch's forested Pacific Northwest: arid, desolate landscapes meet vast salt deserts, such as the Puna de Atacama, where rainfall is almost nonexistent. In 1956, Dr. José Cerato and geologist Claudio Spitch discovered the footprints of a Bigfoot-like creature at an elevation of almost 16,000 ft. The prints, according to Spitch, were so large that they precluded the possibility of having been made by a human being. Shortly after Cerato and Spitch's discovery, a muleteer named Ernesto Salitonlay (name also given as José Santolay by some sources) led his animals into a lowland area and was startled by "a strange being covered by dense hair" that let out piercing screams upon seeing the human, terrifying the pack beasts in the process. Salitonlay said that the bizarre creature looked more like "a large, agile monkey" than anything else and fired his shotgun at it, but missed the target. The hairy hominid took flight and the muleteer headed post-haste to the local police station to report the incident. Authorities looking into his claims surmised that it could have been the Ukumar Zupai described in the legends of the Coya inhabitants of the region. From all descriptions, the Ukumar was smaller than its Himalayan counterpart. It had a pointed head and projected its body forward when it ran; the natives became accustomed to hearing its cries at dusk and in the winter months. There was also the interesting detail that locals would come across ruined condor and eagle nests, high in the mountains, which appeared to have been ransacked by a savage attacker, leaving dead and injured birds in its wake. The creature was not seen again until a hapless prospector named Benigno Hoyos, combing the Quitillipi region for minerals, was caught by an unexpected snowstorm in the vicinity of Morro del Pilar and was forced to take shelter from the elements in a cave...which turned out to be occupied by an "unknown creature of large proportions, similar to a bear." The prospector was able to fire his sidearm at the improbable being and scored a hit: the creatures screams turned into heart-rending cries of pain. According to anthropologist Silvia Alicia Barrios, hunters have successfully apprehended live specimens of Bigfoot's southern cousin. One such case involves the capture of a family of Ukumaris--a mother and two offspring--by Andrés Olguín. The two young Ukumaris were allegedly turned over to a Paraguayan zoologist. A Possible Connection with UFOs? 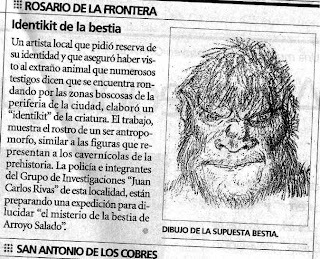 Manual de Criptozoología Argentina y Sudamericana (1990), mentions the Ukumar-Zupai in his catalogue of hairy hominid sightings: In July and August 1956, the La Gaceta newspaper began to publish a series of articles (obtain with the aid of Chilean researcher Liliana Núñez) about the creature seen in the vicinity of Nevado Macón, a Andean peak standing 5700 meters above sea level, where "huge human footprints larger than those of an elephant have been allegedly seen." Picasso notes that the sightings of the Andean hominids commenced shortly after a flurry of UFO sightings in the area, to which the newspaper items attest: in 1955, the year before the first hominid reports began, a strange object had crashed into the slopes of Nevado Macón in full view of the residents of the villages of Tolar Grande, Caipe, and Quebrada de Agua Chuya, all in the vicinity of the Salar de Arízaro. Apparently, prior to colliding, the vehicle had flown over the region all day, making themselves visible to workers at a Public Works shanty and members of the local gendarmerie, who took photos of it. The Ministry of Aeronautics's Information Service received a request, says Picasso, to conduct an investigation to determine if the crashed object was either "an aircraft or an aerolite", but nothing appears to have been done in this regard. The fact remains that strange luminous artifacts continued to be seen over the Andean deserts, first hovering over the dusty villages and then giving the appearance of descending in the mountains. Author Gustavo Fernández adds the interesting detail that an official police communique revealed the crashed object was cylindrical and measured a whopping three hundred fifty meters long by fifty meters in diameter (approximately 1000 ft. by 165 ft.) and was metallic in color with a "dark band" visible across it. Despite the fact that it was wingless, it executed sharp and sudden turns, leaving a smoky contrail that remained visible for four hours. "This anecdote," states Fabio Picasso, "appears to contain the seeds of the oft-mentioned theory regarding the link between UFOs and Yeti-type creatures; a theory which would was foreign to the specialized media and was only approached in the 1970's by Angelo Moretti, regarding South American cases involving primitive beings found amid a sweeping UFO flap." The author cautions his readers that this should not be construed as the creatures and the UFOs sharing the same origin. It is possible that the powerful crash into the mountainside drove the hominids out of their lairs. In 1963, the village of Ranelagh in the Province of Buenos Aires was visited by a strange entity whose journalistic moniker, El dientudo ("Toothy") de Ranelagh came from its extraordinarily long fangs. For eight days, according to Gustavo Fernández, residents of this unpaved shanty town, surrounded by contaminated streams, were haunted by the fearsome "Toothy". This shaggy entity, standing some six feet tall, had phosphorescent eyes and was seen by a number the witnesses late at night near a small bridge. Unlike most cases involving hairy hominids, "Toothy" lashed out against humans, injuring a few of them; but it saved its true rage for dogs. According to reports, the monster killed several and devoured them. "Toothy"'s short reign came to an end when a police officer fired his service revolver at the monster one night; the following morning it was ascertained that blood had been found next to its footprints. Police speculated that the creature, wounded to death, had fallen into Ranelagh's polluted creek. It was never seen again. There are more recent cases of strange creature activity in Argentina: Carlos Alberto Iurchuk, editor of the El Dragón Invisible journal, received a letter from one Gustavo Aufnerr--owner of an estate in the municipality of Carlos Spegazzini--regarding a 1996 encounter with the unknown. Aufnerr was walking through a forest trail one summer evening when he heard a noise behind him. Upon closer inspection, Aufnerr and a companion shone their flashlights toward the ground, only to find the carcass of a dog, eyes vacant and jaw torn off. Gripped by fear, both young men heard the noise once again. As they moved away, they came across another carcass--this time that of a cat, slain in the same gruesome fashion. They only did what could be expected in such a circumstance: they ran. But their frantic race toward safety was interrupted by "something" that crossed their path in a sideways motion, crossing the forest trail from left to right. According to Aufnerr's description, the strange "something" was about the size of a dog, but running on two legs, with a rounded head smaller than its body, and with claws dangling from the upper part of its body. The Pyrenees--the mountain range separating the Iberian Peninsula from the rest of Europe--also appear to be the home of a fascinating mountain hominid. For centuries, there have been reports of hairy, foul-smelling creatures known as basajún in the Basque country and simiote or simiot in Aragón and Cataluña. Author Miguel Aracil went in search of this elusive manimal at the behest of Spain's Más Allá magazine and ascertained that belief in the simiots, far from being medieval legend, was current fact. Medieval tradition, which has survived to our time as chronicles and artwork (two 12th century images of the simiot are known to exist, depicting it as a creature resembling the "black cats" that haunt the British countryside), holds that the simiots killed entire flocks of sheep and an occasional human. As in other countries, these Pyrenean hominids issued strange cries, grunts and wails, aside from a noisome odor. Aracil writes that a group of woodsmen from the wild Pyrenean region of Peña Montesa was attacked by "a bizarre, hairy creature with semi-human features" which went on to indulge itself a vandalistic frenzy, shattering vehicles and heavy forestry equipment and even hurling tree trunks against humans, according to one account. Groups of volunteers scoured the mountains in search of the being but came up empty-handed, suggesting that it hid away in "the enormous caves that are found in the region." Many years later, a tourist who had gone hiking in the area had a face-to-face encounter with the creature and was astounded by its foul smell. Scientists have dismissed the simiots as mere folktales. French scientist Alain Pillaire believed that the reports concerned a "baboon", regardless of the fact that these animals are found in equatorial Africa and are seldom over three feet tall. Alfonso Serra concurs with Miguel Aracil, stating in his book Misterios Ocultos (Barcelona: Protusa, 1997) that gigantic skeletal remains of great age have been found in the Pyrenees, some of them buried near the prehistoric dolmen of Oren, in La Cerdanya. Nothing further was ever heard about them after they were turned over to the Barcelona Archaeological Museum. Another giant skeleton, allegedly measuring three meters long, was found in near Garós in the Pyrenees: it had the peculiarity of having had an ancient piece of iron driven through it. Could it be possible, as many authors have suggested in past decades, that humanity is not quite alone on this planet? This question has usually been raised with regard to presence of extraterrestrial life on our world, whether visiting in passing or possessing permanent bases on it. But in this case the question is directed at the very real presence of other beings--possibly sentient--living in remote or nearly impenetrable parts of our world.